Even though Harvey and Irma both threatened to change our friend’s travel plans, Matt and I were determined to head toward Aruba. 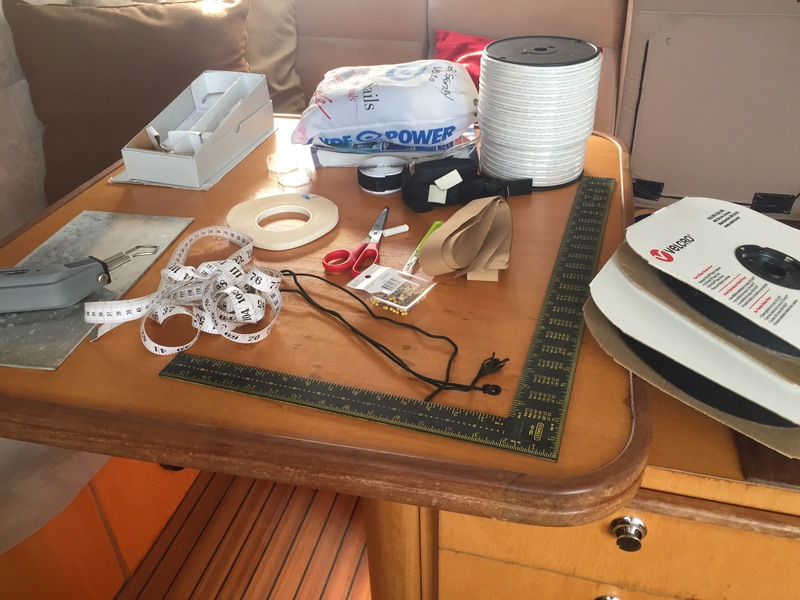 After our massive provisioning run we were ready to head to Santa Cruz Bay which is the closest bay to Aruba. This will shave 25 miles off our trip to Aruba. 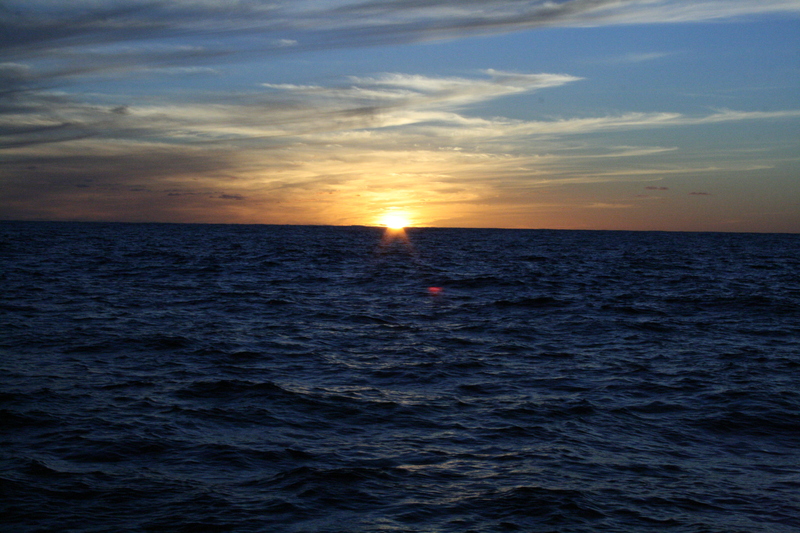 Our thoughts were to sail to Santa Cruz Bay and then get up early the next day and sail to Aruba (which is about 50 miles). 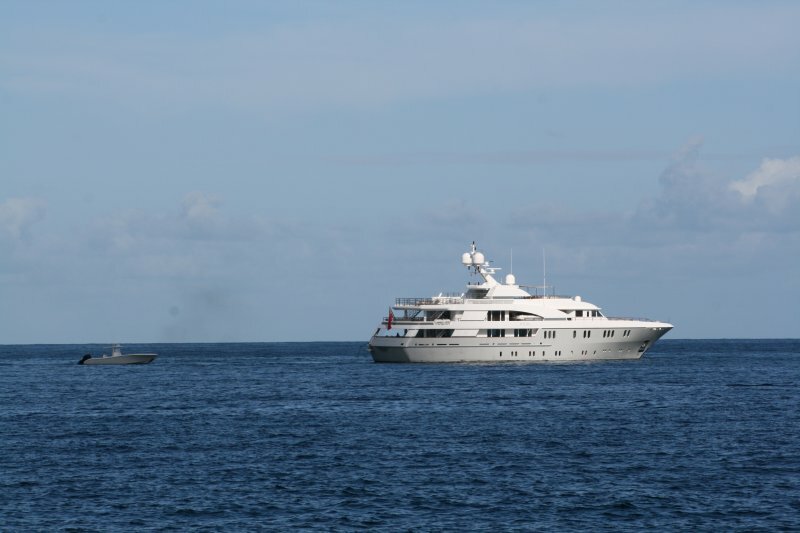 We said “good-bye” to our Curacao friends, pulled up anchor and headed out. 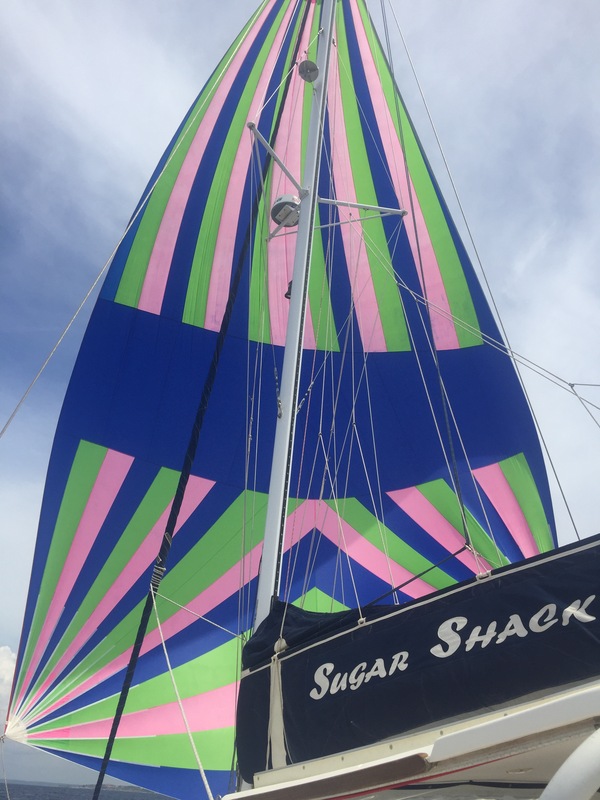 It was a beautiful day providing a nice trade wind – perfect for a spinnaker sail. 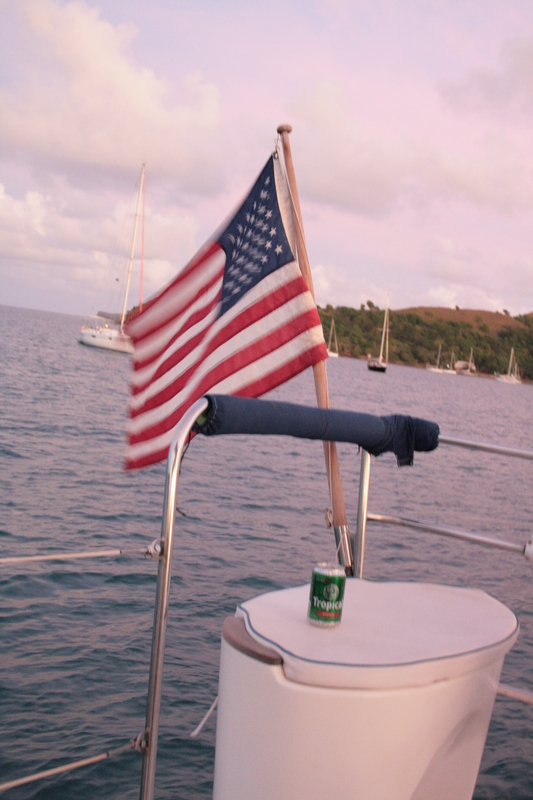 Matt pulled out Betty, our smaller spinnaker sail and off we went. 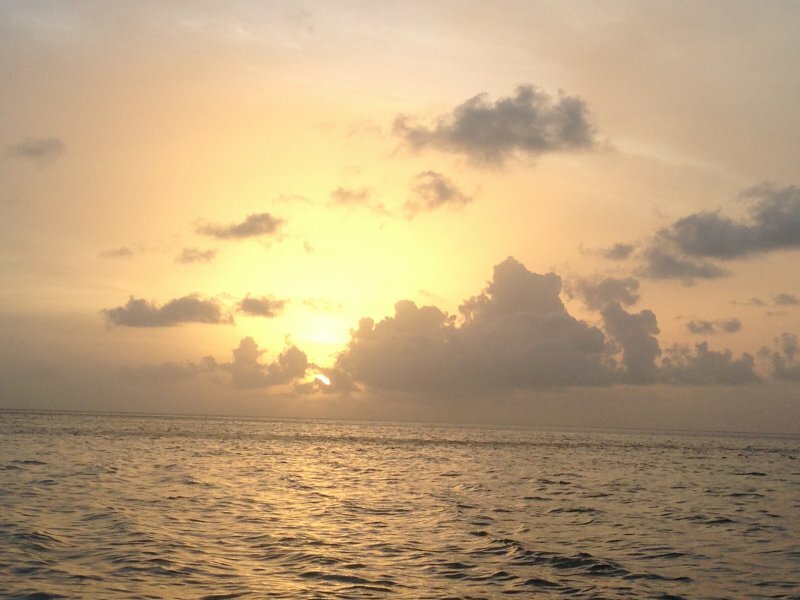 We enjoyed an absolutely spectacular sail day – which we had not had since we arrived to Curacao almost 3 months ago! 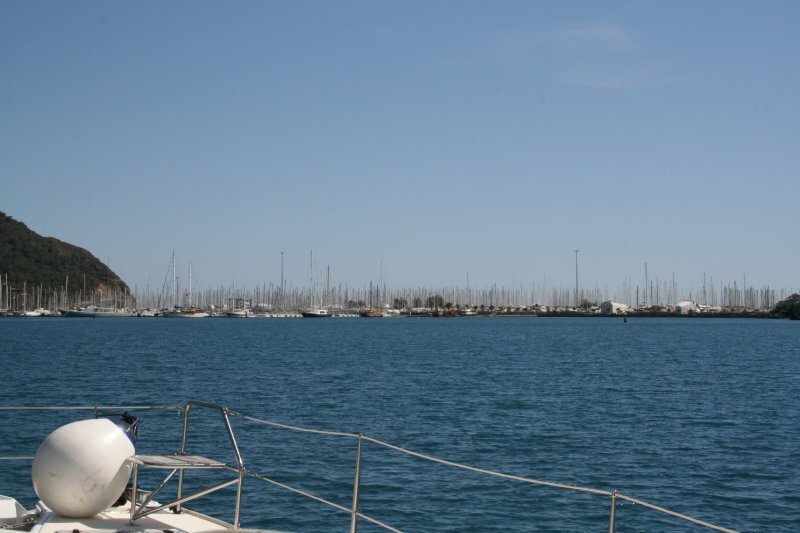 We arrived at Santa Cruz Bay a little over 3 hours later and there were no other boats around nice. This is where Captain Good Life has his shop and rents out canoes and kayaks to those who want to visit the Blue Room and Mushroom Forrest. He also provides guided tours on his boat if you are interested. It took us a few times to hook the anchor as the ground is very hard with patches of coral. 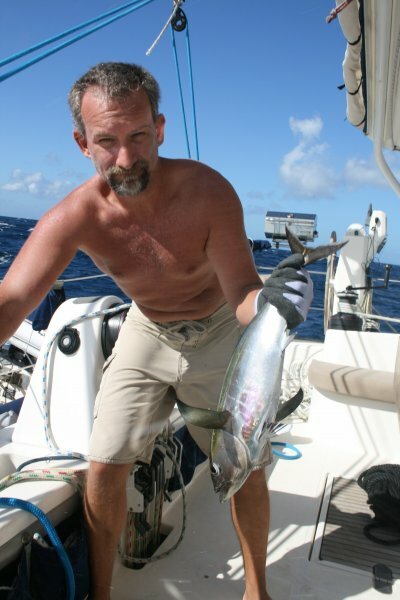 Once we hooked, we jumped in checked the holding, and snorkeled a bit. As we were making dinner, I started texting with Sharon, our friend who was to meet us in a few days in Aruba. Their original flight was out of Houston which was rerouted a week ago to Orlando due to Hurricane Harvey. Then on Friday (4 days prior to their trip), the airline cancelled their flight. 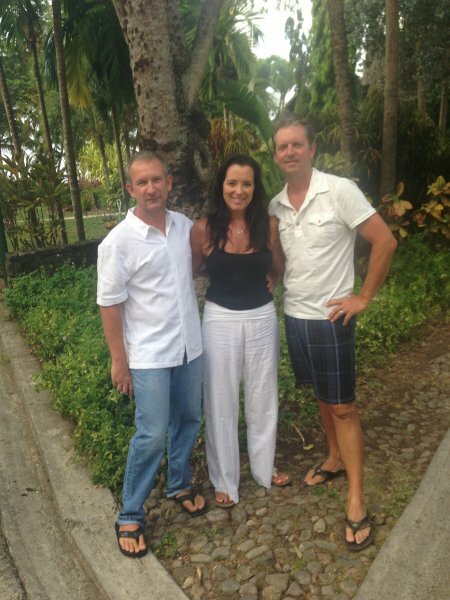 They were able to reschedule their trip to Aruba for October. So, we had a decision to make. Do we stay in Curacao (where we have already spent 2 months), head to Aruba (where it tends to be pricey), or go back to Bonaire? It did not take long to decide as we both wanted to go back to Bonaire. 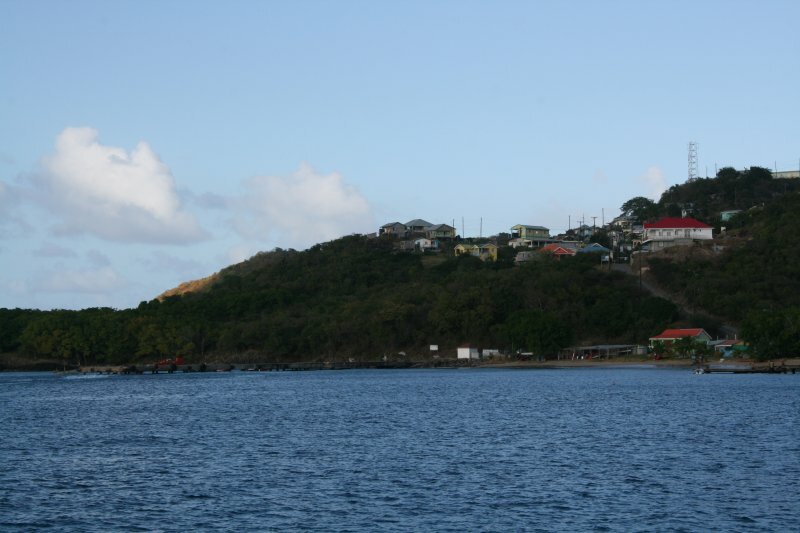 The beautiful water, upcoming regatta, and idea of more dive adventures was too alluring for us. So, instead of getting up early to head to Aruba, we got up early to head to Bonaire which is a beat into the wind and waves. 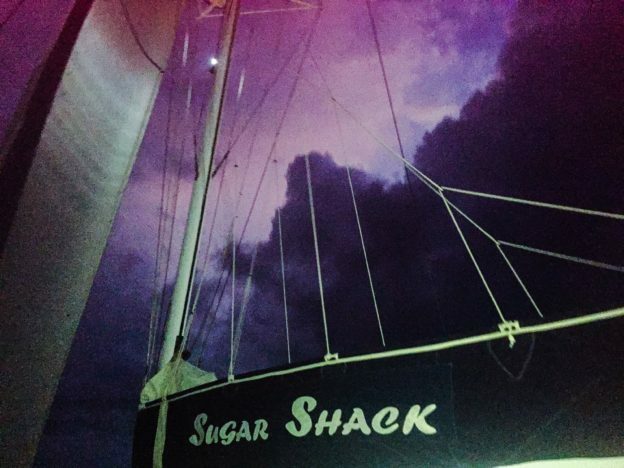 The alarm went off at 445am, anchor was up by 5am, and we were out of the bay by 515am. Good start! 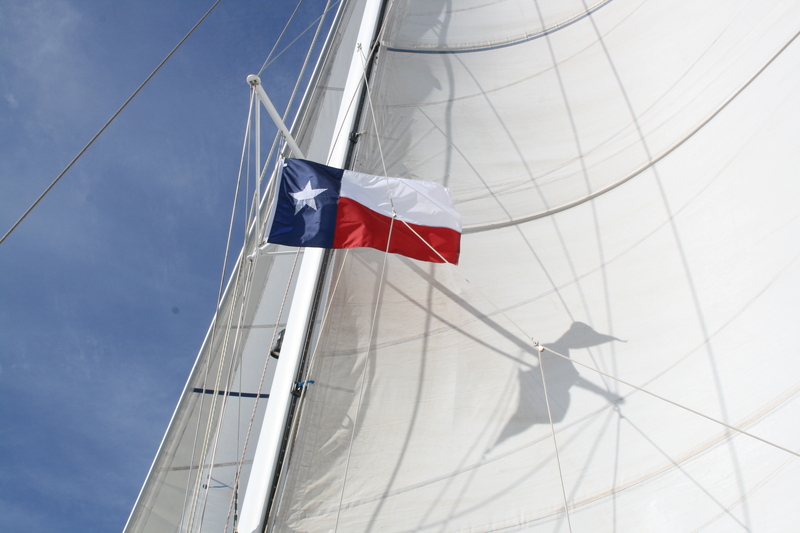 We were actually able to raise the sails to one reef with the thought we could shake it out if the winds behaved. 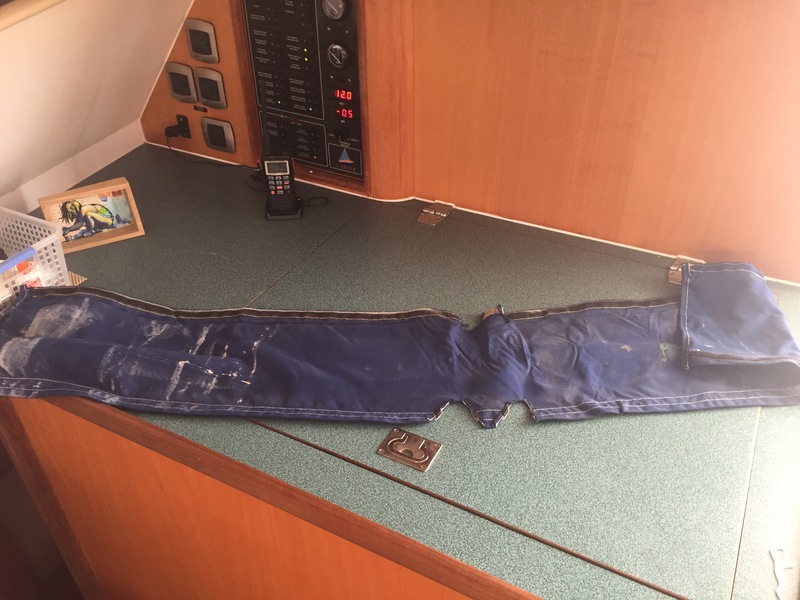 We managed to hold our course, with the sails for about the first 4 hours. However, several rain storms had a different idea – they kept pushing us off course, further and further North. When we were -7 VMG and wet from the rain, we decided to drop the sails and motor to course – directly into the wind and waves. It was not our best day, but also not the worst. We encountered several more storms that kept the boat wet, rocky and rolly. Since we just provisioned, our fridge and freezer are full, and I mean FULL! But Matt could not resist putting the fishing lines out. He justified it by not putting out the teasers – (don’t worry that logic did not make sense to me either). After about 8 hours (2 hours to go), of nothing, we noticed a huge flock of birds circling around movement in the water. Fish! We headed in that direction and low and behold, one line went “zing” and then nothing – no pulling or bending of the pole. Hmmm, As Matt reeled it in, we realized we did have fish on, but it was a little fish. Even though it was a Mahi, Matt’s favorite, we set her free to grow up big and strong. We got one more bit on the hook, but it was not meant to be. 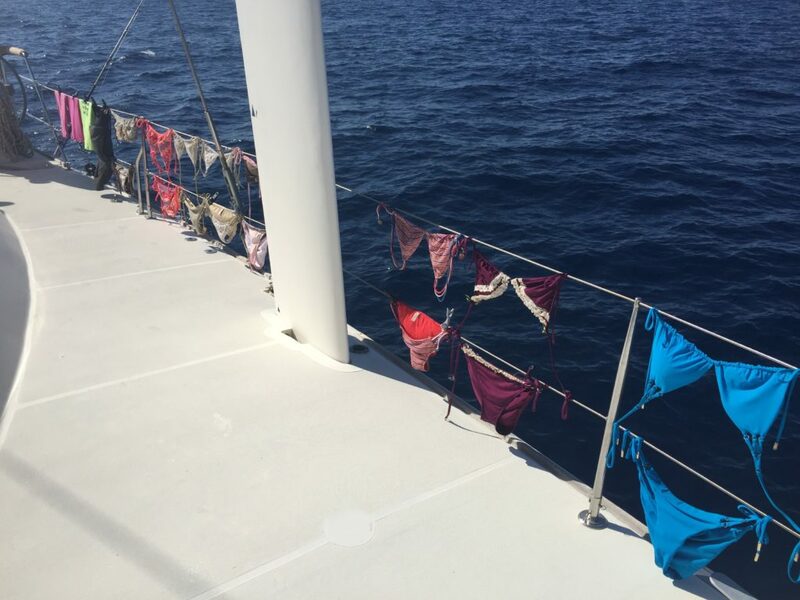 As we were pulling up to the mooring field, where we were hopeful to find a mooring, we were greeted with a fabulous welcome party. Manuel, Nadja (and a new friend Sean) from Manado were in their dinghy to help us secure to a mooring, then Thea (from Kattimi) came over in her kayak, Cindy (from tranquility) came by in her SUP, and Susan (from Nomad) swam by while doing her laps. Of course some of these peeps were just out enjoying a nice calm afternoon – but they ended up swinging by to welcome us back – good to be Sugar Shack! We tried to clear in to customs and immigration, but they closed early (it was Saturday after all), so we stopped by Illy Coffee for a treat and wifi. 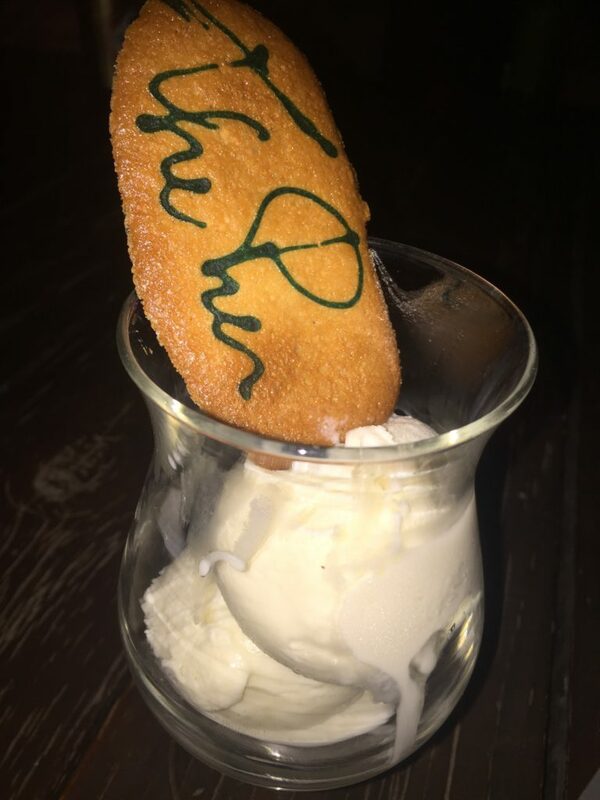 I have to admit that it was really tasty ice cream, but I am partial to Gio’s. Afterward, we stopped by Karel’s for happy hour (and more wifi) and then headed back. 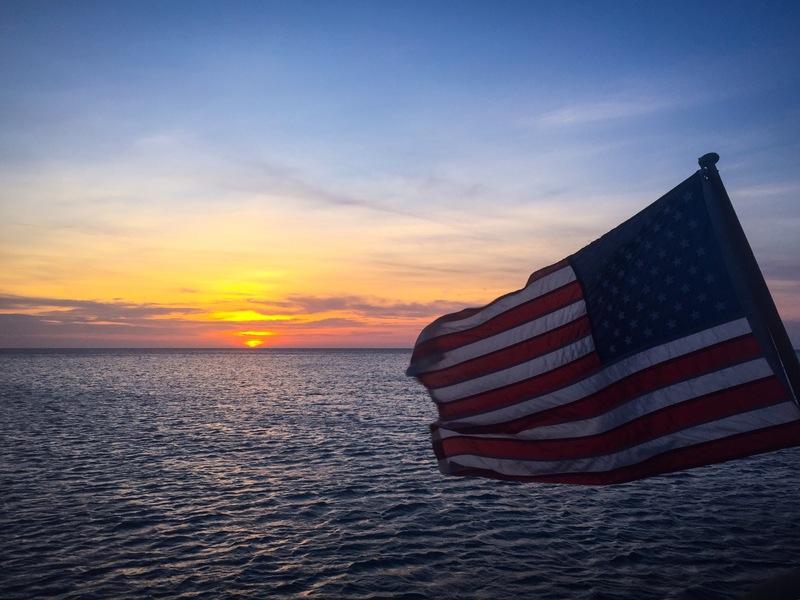 Before the sun set, we had been invited to a birthday party the next day, another day out on Ad Astra and drinks with friends. It’s hard to call “Bonaire” a “Bust” especially since we are so happy to be able to return to this beautiful island. 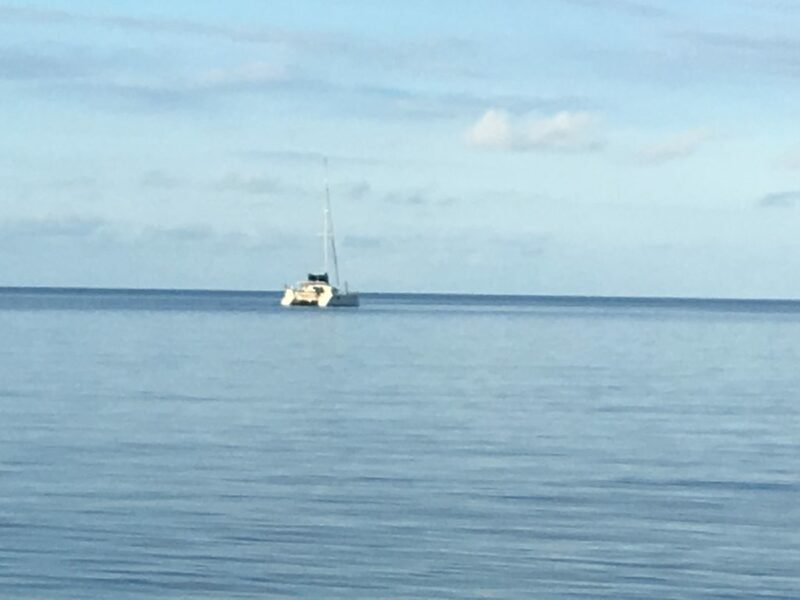 This entry was posted in Aruba, Bonaire, Curacao and tagged boat life, boating, bonaire, catamaran, catana 471, curacao, fishing, illy coffee, sailing, santa cruz on October 26, 2017 by Christine. “Goodbye Bonaire” Our friends, Shawn and Sharon are meeting us in Aruba, so we needed to leave our beloved island of Bonaire to head south west. 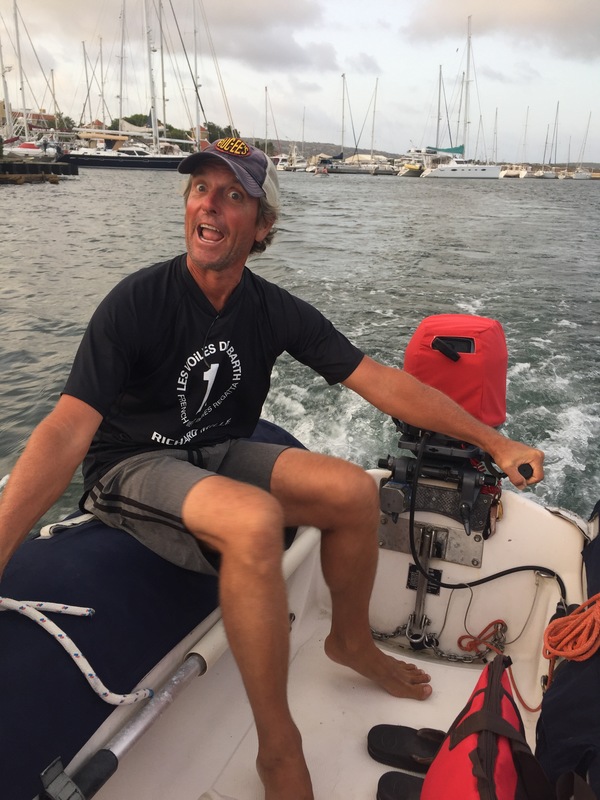 Unfortunately, there was no wind (less than 8 knots) so we ended up motoring the entire way from Bonaire toward Klein Curacao. On the way over, we ran the little generator, water maker, and washer machine (did you know we have a washer/dryer on board – oh ya!). Of course, I was just doing my delicates and things that needed to be lined dried so the laundry service could focus on towels, sheets, and other bulky items. 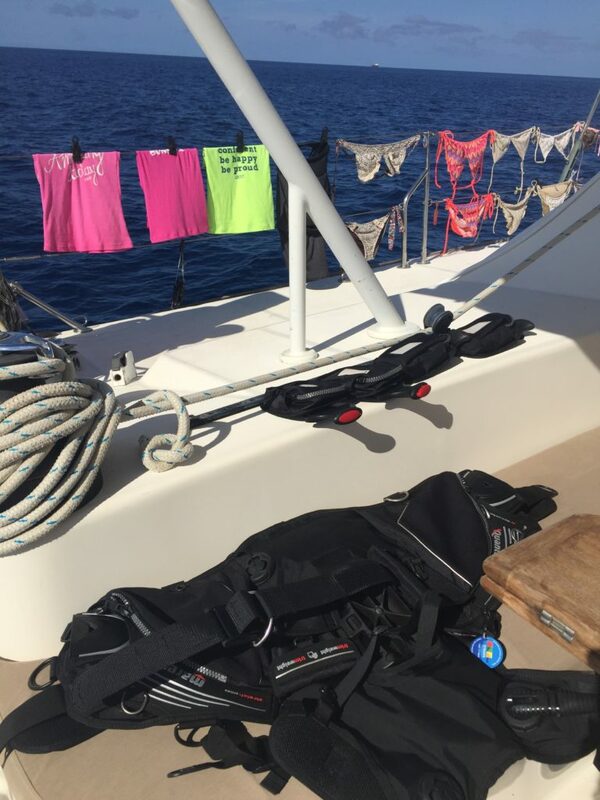 We also had to dry out our dive gear so we could stow it for a few weeks on board. We happened to leave at the same time as Always Sunday so it was not a surprise to hear them hail us on the VHF. 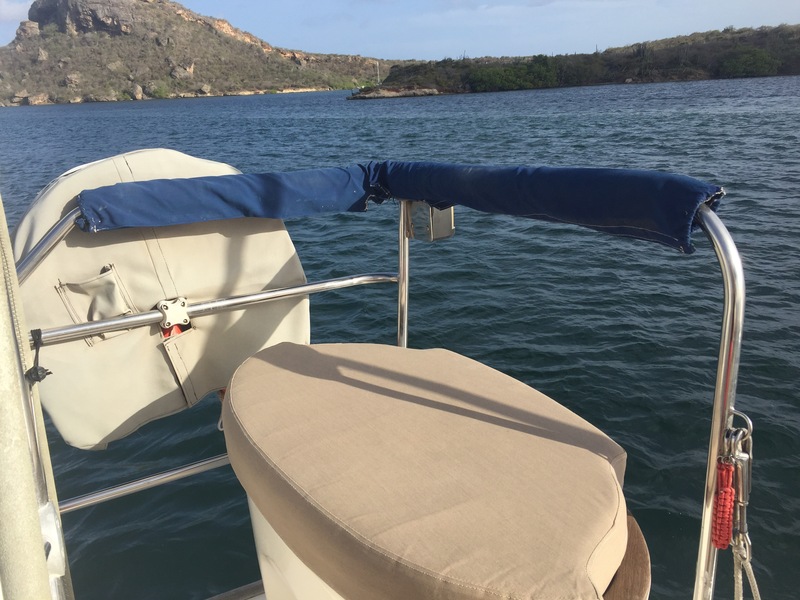 They talked us into heading to Klein Curacao for the night – they did not have to try very hard as we loved this little island stop and just needed a reason to stop short of Curacao. 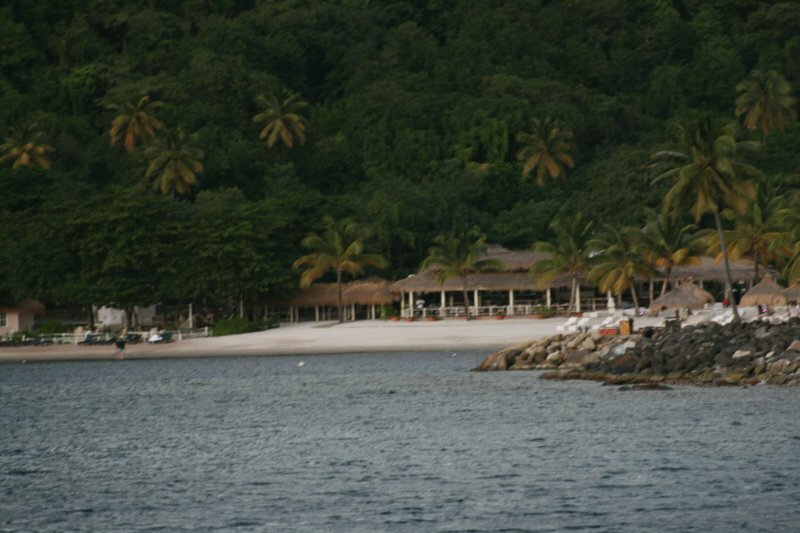 When we arrived, we met Ricky and Robin (Always Sunday) for a snorkel where we saw lots of turtles, a few scorpion fish, an eel and lots of other little sea creatures. 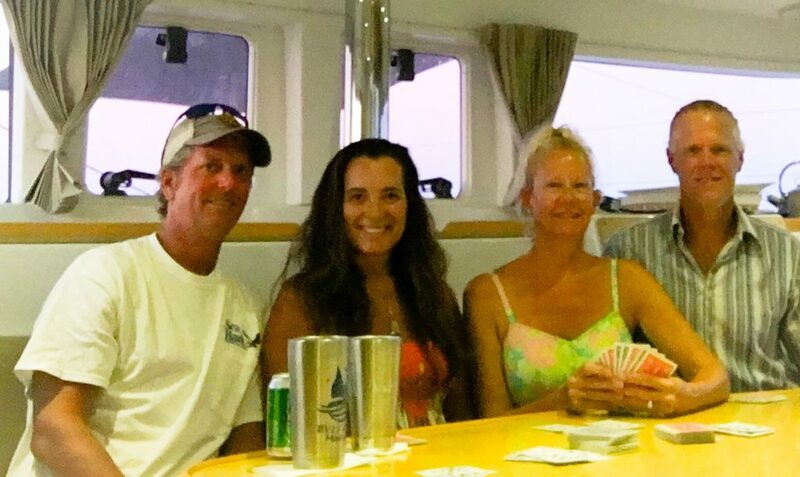 They invited us to their boat for tuna and a card game. 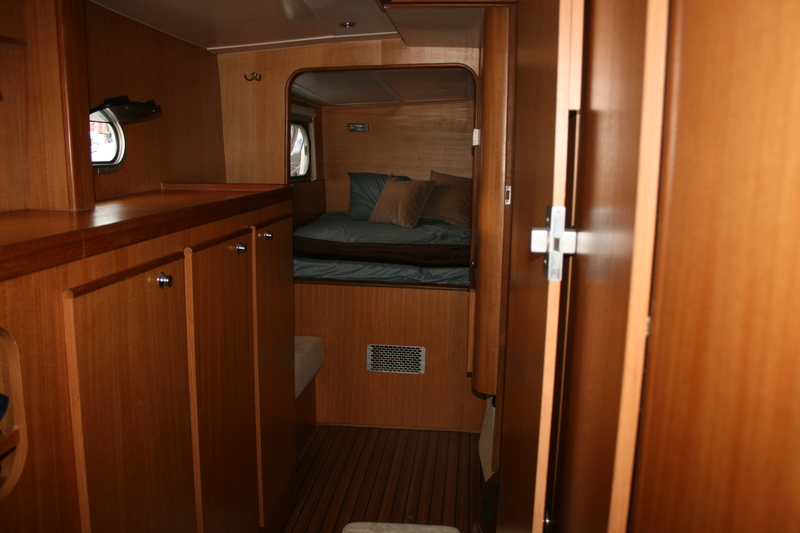 They have a beautiful 40’ Lagoon 2013 that is immaculately kept. Robin prepared a lovely tuna dish and taught us a new card game that Matt dutifully won. Despite the fact that they let me cheat my times, I still came in last. 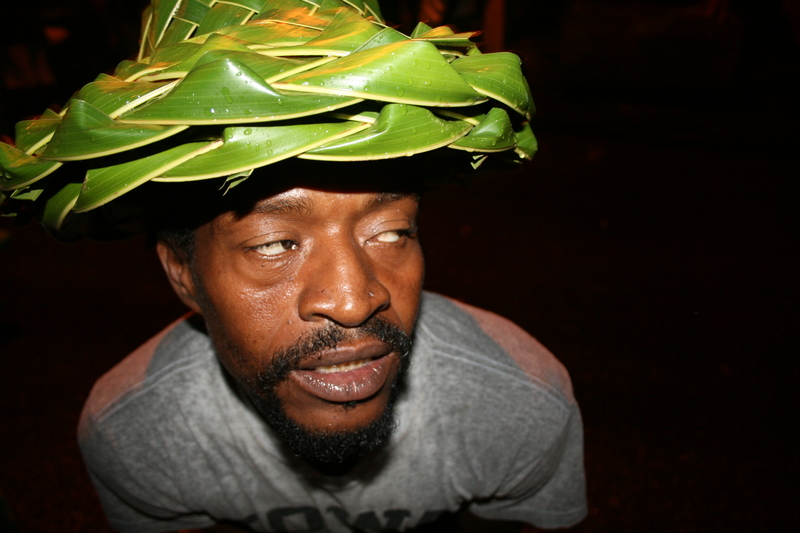 Once we arrived in Curacao, we rented a car and ran a bazillion errands: dropped laundry, Budget Marine (pick up Life Seal that we ordered), Scuba and More (fix our regulators), Digicel (update our data plan), customs & immigration, Cost U Less, Best Buy, Vruegedenhill, Van Den Twill, Kooyman, Mangusa Grocery and Centrum Market. 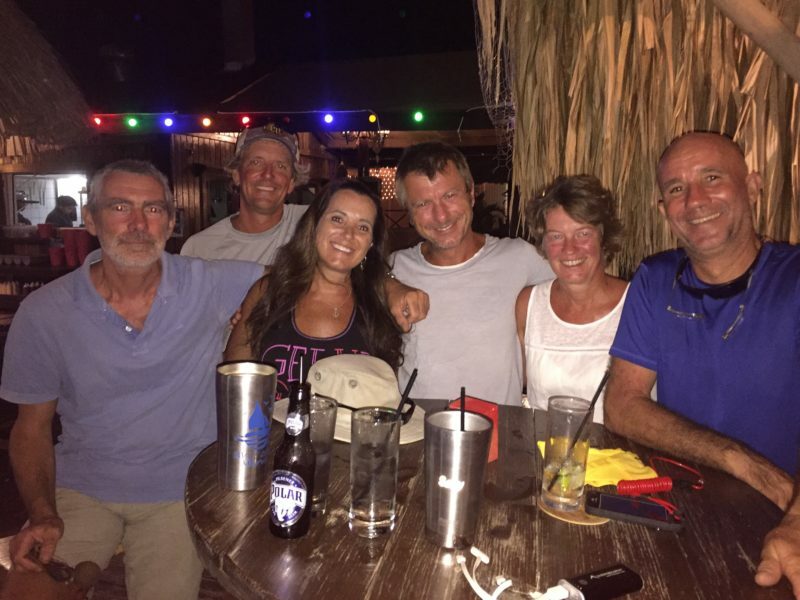 We managed to get back in time for happy hour where we met our friends Steve (Kialoa III), James (Moonrise), Matias and Ulreke (Bella) for a final toddy before we head West. The next day, we picked up our clean laundry, repaired regulators, and a swung by few more stores to find some elusive items (diet coke, diet ginger ale, mozzarella, and ribs). 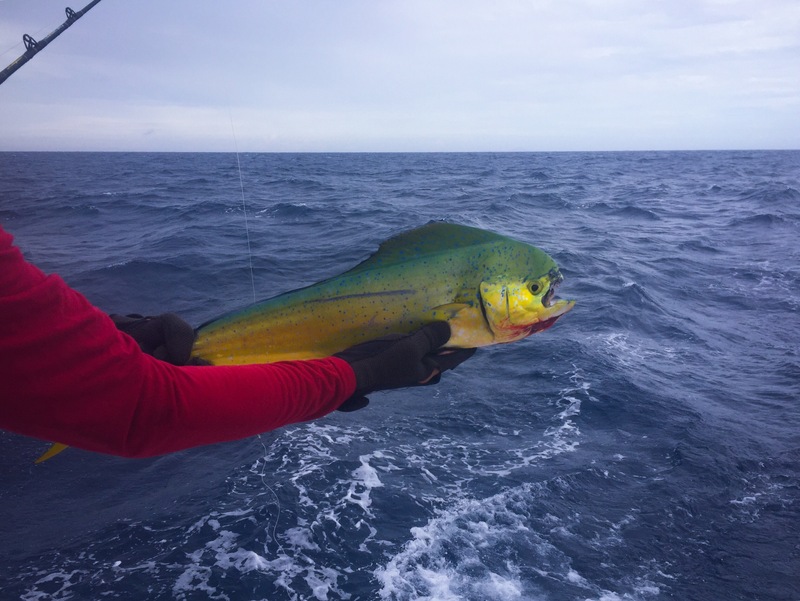 We returned to the boat to unpack and stow all our goodies and headed to The Pier for the weekly captain’s dinner where they were serving dorado which was delicious. We enjoyed hanging out with our friends and 25 other boater pals of Spanish Waters. 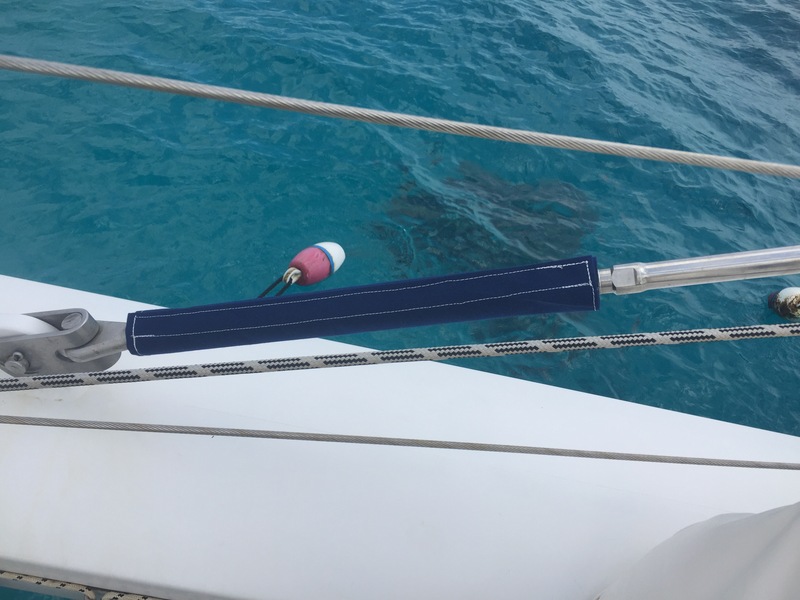 This entry was posted in Aruba, Bonaire, Curacao and tagged boat life, boating, bonaire, catamaran, catana 471, curacao, klein curacao, sailing on October 24, 2017 by Christine. We have had a laundry list of sewing projects that we have been “meaning” to get to but haven’t had time. Maybe it is because there are so many and it is overwhelming, maybe because setting up the sewing machine is a “process” maybe because I was not 100% sure I remembered how to sew (since it has been 35+ years since I touched a sewing machine), or maybe it was just plain procrastination (and a combination of all of the above). 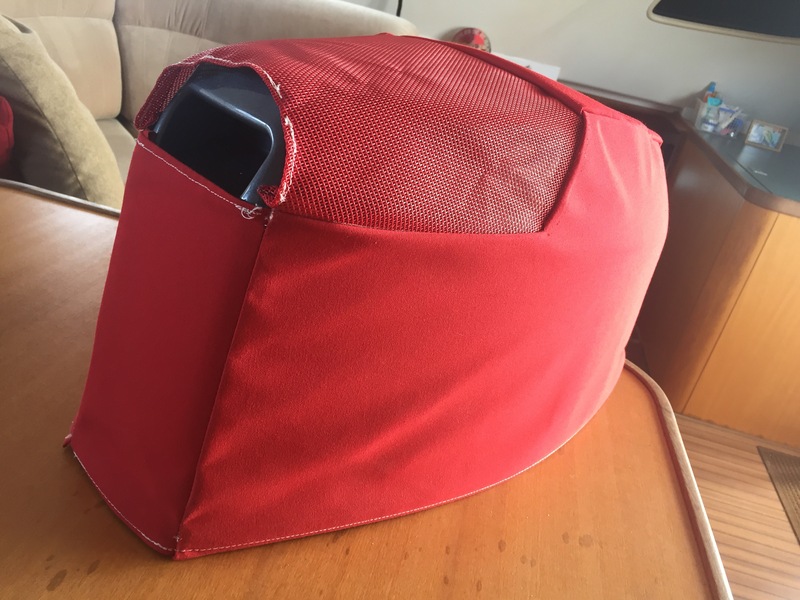 My first project(s) was to create new helm seat cushion back covers. Our current blue ones are stained, torn, falling apart and need to go. Old helm seat back covers in blue. Yep, we procrastinated long enough – these need to go. 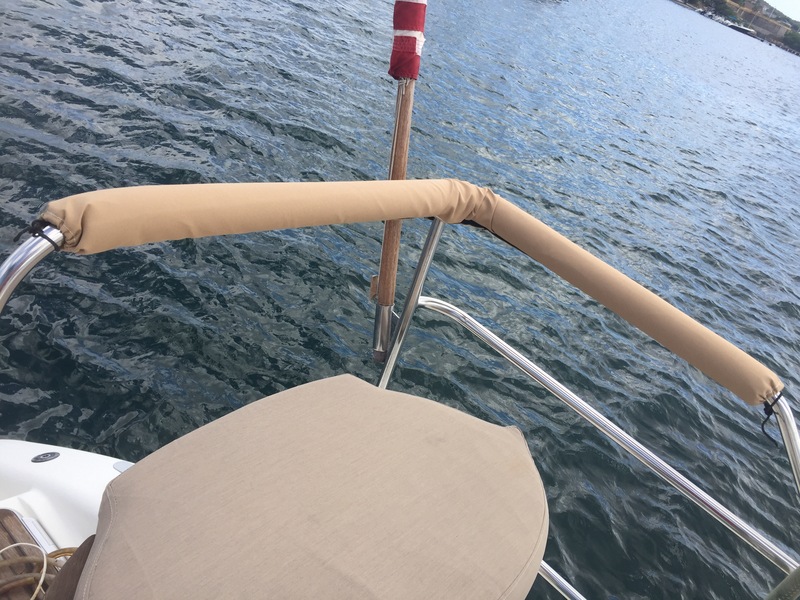 So, I took the Starboard one off first, measured, double and triple checked the measurements, created a pattern, transferred the pattern to the fabric and cut into my huge 15 yard roll of Sunbrella Toast fabric. 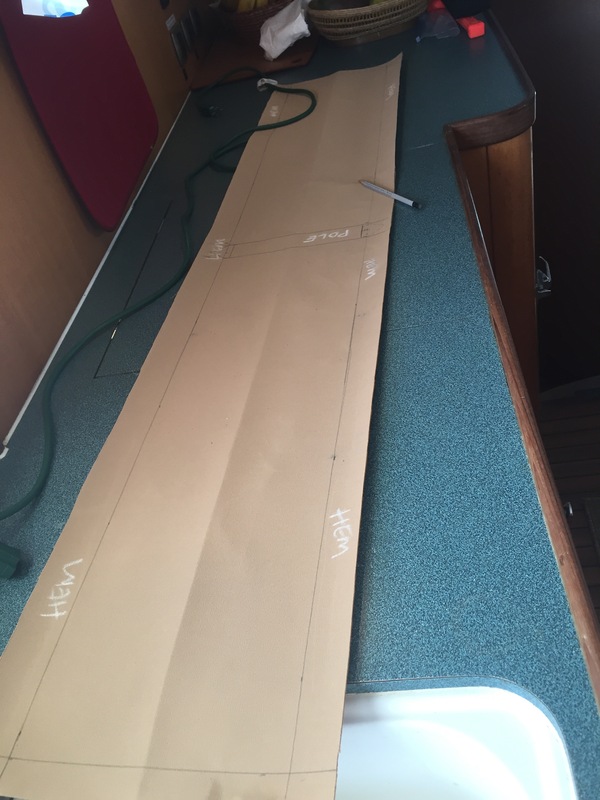 Transferred my pattern to the fabric. After I created my pattern on the fabric, and remeasured and cut the fabric with a hot knife to prevent loose strands. Then added basting tape to hold the hems cleanly to the fabric. Basting tape for the hems. Next, the female velcro was added to one side (we used velcro that had a sticky back side). Then I flipped my piece over and added the male velcro (so that when the piece is rolled they stick to each other). Test, with just the basting tape holding the piece together, I take it outside and test to see if my measurements were correct. EEEK Gads! They are not! 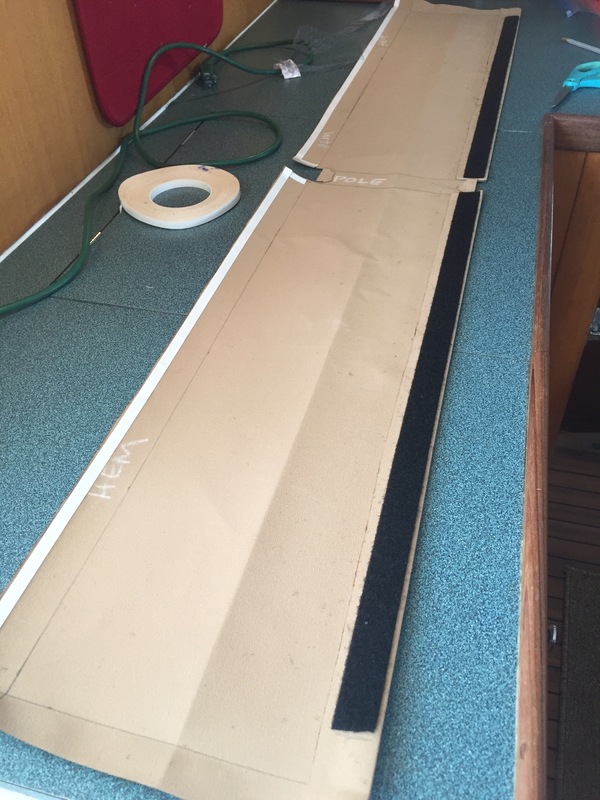 I had measured the circumference 7 3/4 but did not take into account an extra 1″ for the velcro overlap. Yikes. Luckily, I had not sewn anything yet so I had to go back a few steps, shorten my hem and create an overlap so that the velcro actually overlaps and sticks together. Yeah! Worked swell. 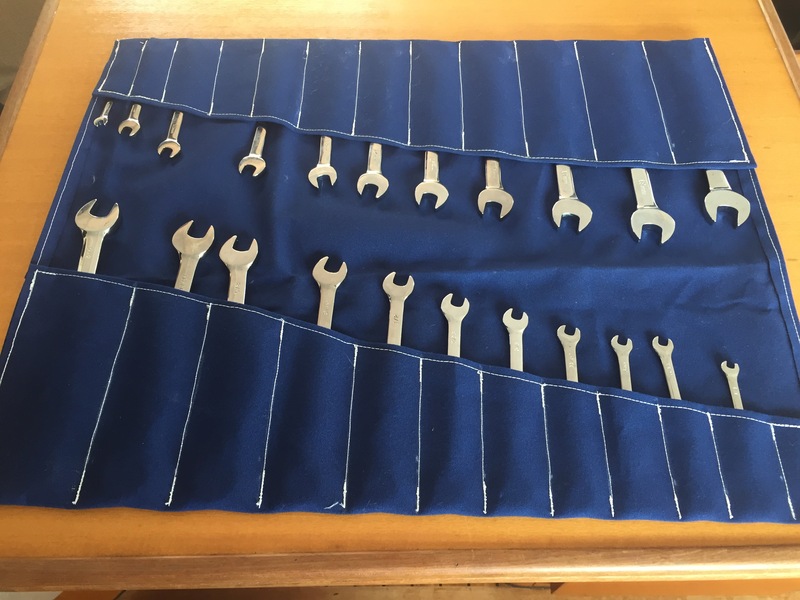 Now the hard part – sewing. 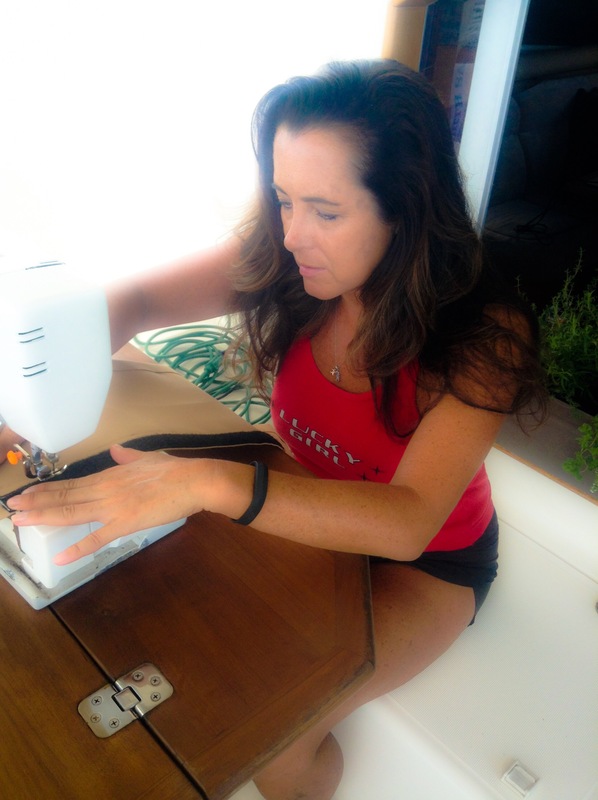 I had not touched a sewing machine in over 35 years and was a little intimidated about using this one. But, Matt figure it out and walked me through a few things, tested using scrap fabric, fixed mistakes, tested again, fixed mistakes, rinse and repeat. Finally when I felt confident, I broke out the project piece and started sewing the velcro to the fabric. Working diligently on getting the fabric, basting tape, and velcro through the machine. Almost done and feeling a little giddy, I start working on the last step which is sewing the end tie pulls into the left and right hems so we can pull them tight to hug the pole. Easy enough, little basting tape, hold the line in, shift the foot on the sewing machine to get a closer fit to the line and call her done! Yep, the lines are askew, but not bad for a first project. 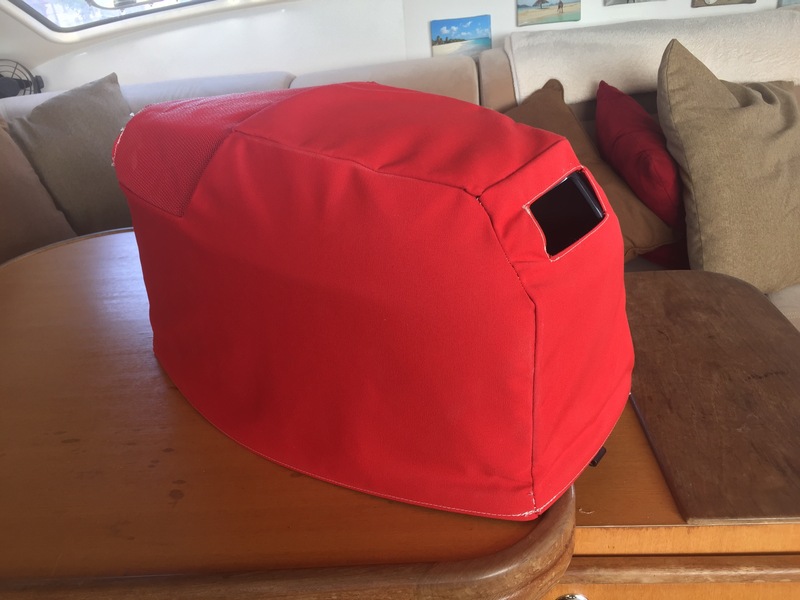 Finished the port helm seat cushion back cover the next day. The first one took me about 5 hours to complete from start to finish and the second one took me about 3.5 hours. Completed port helm back cushion cover. 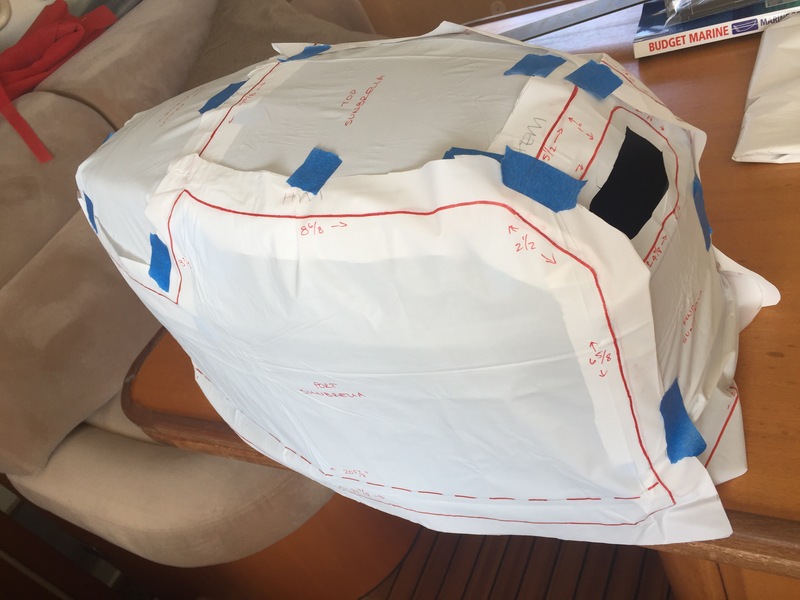 Super pleased with myself, I moved on to a much more complicated project – the outboard cover. 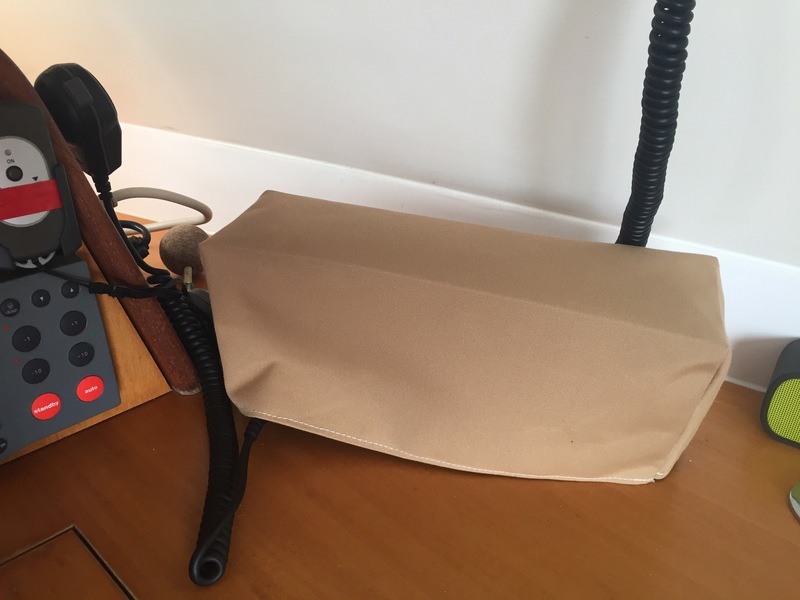 I won’t bore you with a separate email on the outboard cover, just give you the highlights here. It took me 7 times to create a pattern that worked – yep, that is 7 different patterns. Part of it was because Matt had a different idea of what he wanted for the cover than I had so once we got on the same page, we worked it out. 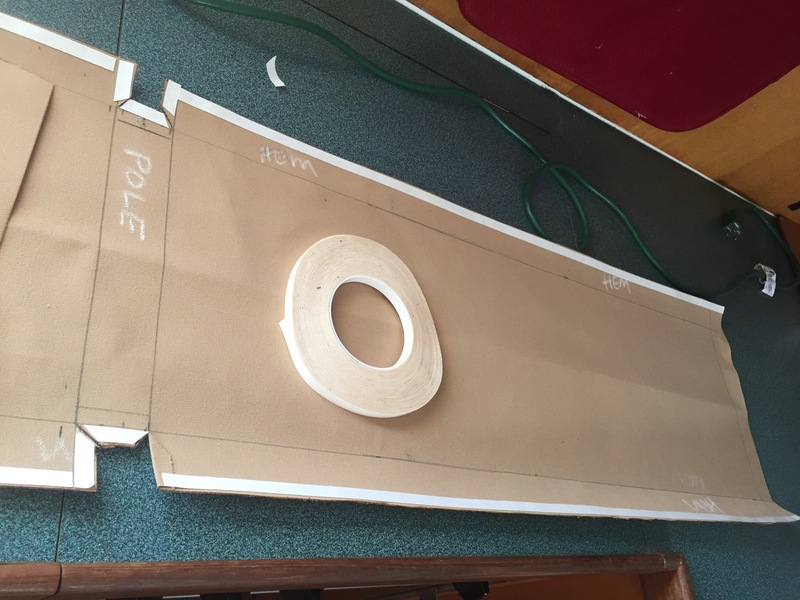 Since it was using two different fabrics and had many curves and uneven measurements, I taped the pattern to the cover to see if it would work before I cut my fabric. Using a shower curtain, I created a pattern. This is way beyond my sewing scope, but I am willing to give it a whirl. Keep in mind that this entire process is over multiple days and I have already been frustrated, recovered, frustrated, recovered, over and over. After blood, sweat and tears (literally all three) Matt and I finished the project together. It was such a relief to have his help, logic, and different outlook and it made all the difference in the world. Let me tell you – this was a complicated project! Glad it’s done. Hole on the front is for the starter handle. 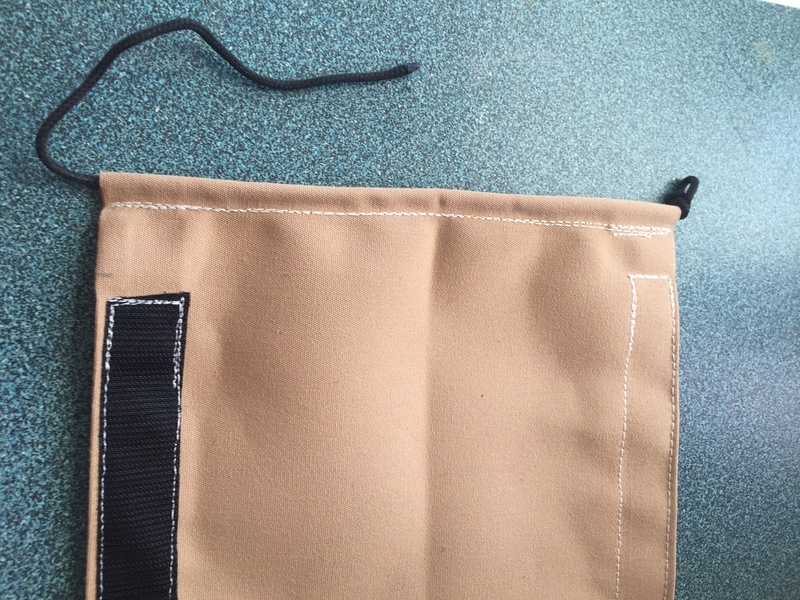 We were going to remove the stitching on the phifertex to make it fit the opening but decided it wasn’t worth it. Phifertex over the to let the engine breathe and hand hold to lift the engine. Matt likes his new engine cover. Next, was a simple cover for our ICOM as the screen is getting wonky from the sun. ICOM Cover at the helm station. 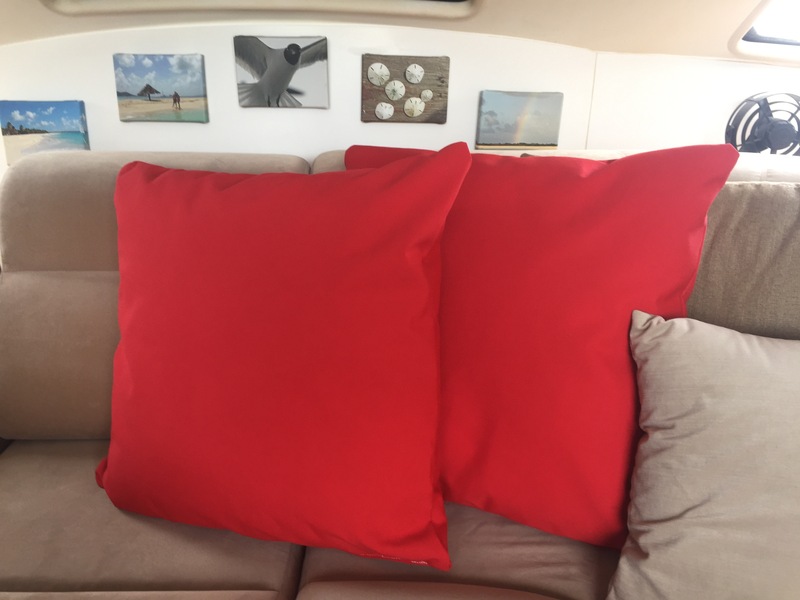 Recovered two new pillows in Sunbrella red to match with the boat better. 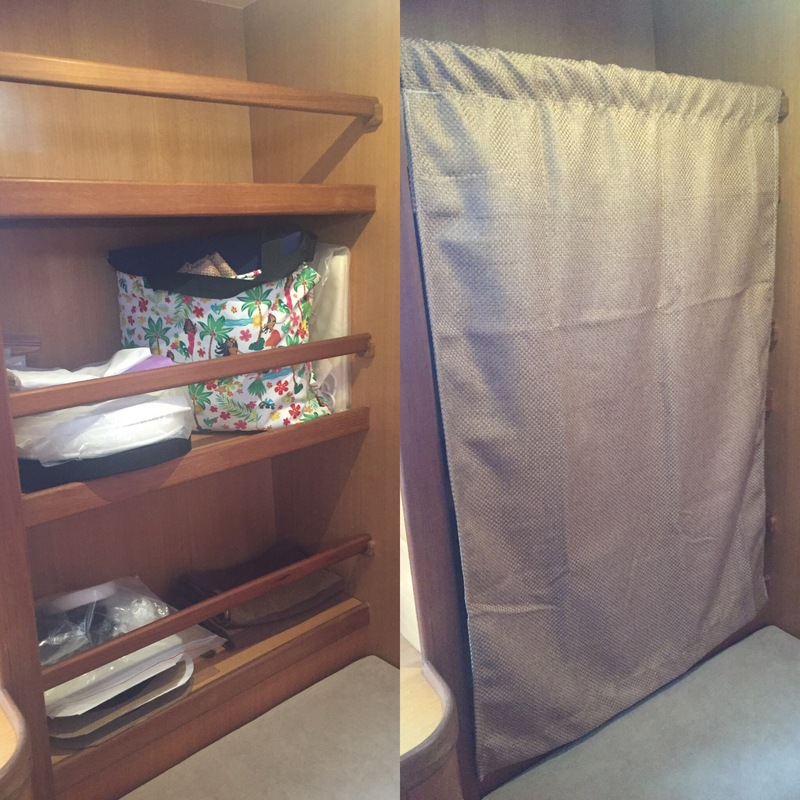 Before & after: Curtain for office shelves with sewing junk. 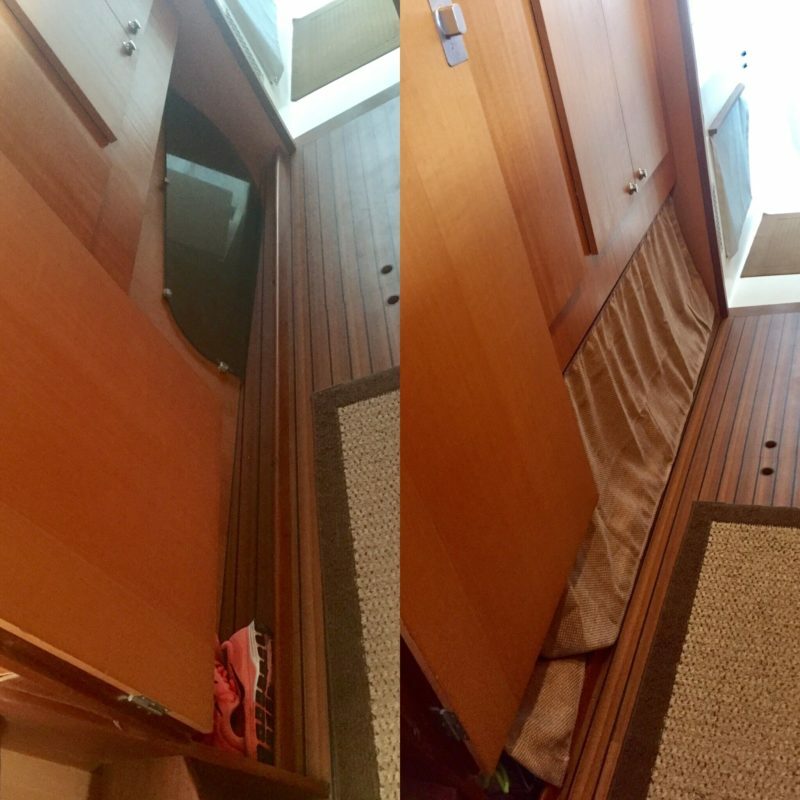 Before & after: hide shoes & yoga mats. Too embarrassed to show true before with all the shoes and yoga mats but you get the general idea. You can tell I don’t like to have my “stuff” to be seen so hide it behind a curtains. 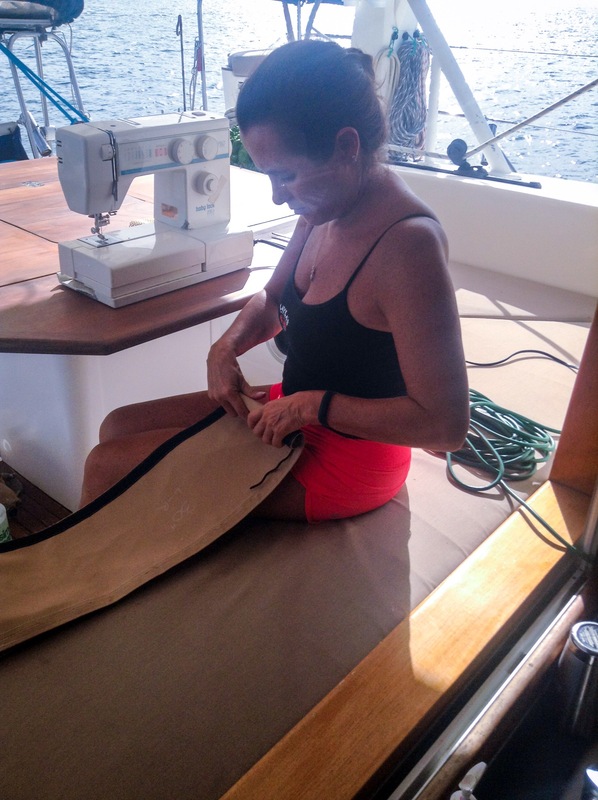 This entry was posted in Aruba, Bonaire, Curacao, Repairs and tagged abc islands, boat repair, curacao, living on a boat, living the dream, sewing on September 14, 2017 by Christine.